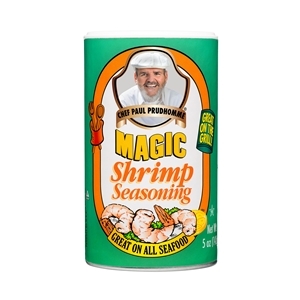 A complex seasoning blend (14 different ingredients) that brings out the best in shrimp. Sprinkle on boiled shrimp, use in shrimp cocktail sauce or in the batter for fried shrimp. Also improves the flavor of any seafood recipe. No Preservatives MSG-Free and Gluten-Free Kosher and Halal approved. Ingredient: Salt, spices, onion, paprika, garlic, chilies, tri-calcium phosphate (anti-caking agent).